Rebecca Svec on the sustaining communal power of a small-town staple: the post-funeral feast. As a child, Diane Jansky knew almost immediately when someone in her hometown passed away. Word would reach her grandmother and her grandmother would be in the kitchen at once, reaching for her dough bowl, then flour, then egg; fingers flying deftly, turning simple ingredients into noodles for soup or rolls from scratch. Lucille Capek has a memory, too, still vivid after 60 years. At a time when there wasn’t always a post-funeral gathering, the meal served at Milligan’s Legion after her father-in-law’s service put a look of wonder and gratitude on her mother-in-law’s face. That’s how it was in Milligan in the 1940s and 50s. That’s how it is today. Is that a civic matter? Can food be a civic service? In a town of 300 the answer is yes. In tiny towns like Milligan (my hometown since 2001), civic means “service” far more often than it means anything political. We don’t have the luxury of thinking surely someone else will fill the role. The list of volunteers is short and oh-so-familiar. Milligan may be best known for its annual June Jubilee, a three-day celebration put on by a small army of faithful volunteers, drawing crowds much bigger than its population. But it’s the funeral meals that stood out to me as a newcomer and even today. At a time when these meals may be catered for a lack of volunteers in some other places, Milligan is a bit of an anomaly. Funeral services usually take place in its churches, funeral home or 1920s auditorium, but families often want the meal served in the H.S.S.K. American Legion Post 240, a downtown building with historical photos of veterans who died in World War I, and the echoes of a thousand polka dances. Diane is the entry point for these meals now. When the call comes in, she orders the foundations of the meal (ham, bread and hot dogs) from Milligan House of Meats. Before too long, an informal all-call has made its way around town and the rest of the food starts rolling in. To call it a potluck would be slander. Luck is for amateurs. This is no haphazard collection of folding tables and lopsided food groups, all pasta-salad heavy and meat-dish light. This is a feast, an outpouring of love by calories: weighty casseroles and lasagnas, meatloaves and meatballs; so many desserts that they have their own counter just before the drinks. The kolaches fly. Word passes down the food line about an “out-of-this-world” broccoli salad, a standout even among this lineup. Only rookies forget to allocate plate room for surprises that may await at the far end of the counter, like pork-and-dumplings and sauerkraut, like Diane’s deviled eggs and pickles from Lucille’s garden. “It’s just a tradition, I guess,” Diane explains. “When someone passes away, we think of food.” She is the current president of the American Legion Auxiliary Unit 240 and to be president, it goes without saying, is to be the nucleus of the funeral meals. So many of those faces are gone now. But the group still pulls it off; a core of six or so working in synchronized routines, refilling coffee pots and stirring Crock Pots. There’s a sign-up sheet to help with organization of the 20 to 30 dishes community members will drop off, but food appears anonymously too, from ham-and-cheese trays to buckets of chicken from Highway 41 Express Stop. The women still talk about the funeral for the man who loved chicken so much his family brought some in from Chances ‘R’ Restaurant in York to share in tribute. Sometimes the sadness of the day crosses the kitchen threshold, reminding them they are serving a meal for someone they shared countless meals with. They don’t forget the funerals for the young (a term that roughly takes in childhood to age 45.) On those occasions, people line up down the block to file into the legion entryway, tucked snugly between an insurance officeand the library. On a few of those days, they served 300 or better. When numbers are big, grief is raw. “Civic?” they repeat, turning the word into a question. “There’s a lot of help and it’s not hard for people to bring in one dish,” they refute modestly. “And isn’t it the saddest thing?” they ask, when someone dies and there is no one ringing the doorbell, no one thrusting out a covered dish in the hope that food says all when there are no words? They like to see people take too much food; to watch generations of little kids playing on the ramp between the dining area and the bar tucked behind the kitchen. A good meal brings out the anecdotes and the affectionate pats on the back for family members with tough days ahead. The praise is met with a humble turn of phrase.But it really does make a difference, this community/civic service that Milligan takes for granted. A funeral is still a funeral. There will be tears. But here, there will also be cream puffs. Rebecca Svec grew up on a dryland farm in Gage County and now enjoys life on a farm near Milligan. 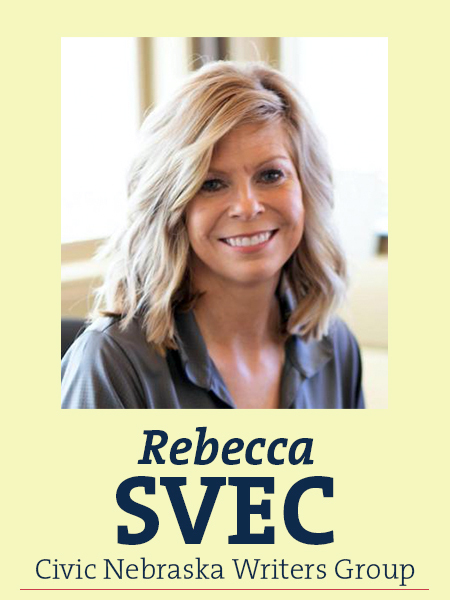 Rebecca, a former newspaper journalist in Hastings and Lincoln, also was Doane University’s director of communications before joining Fortify Group of Shickley, Geneva, and North Platte in 2013. For more Civic Nebraska Writers Group columns, click here.